I wish I had something witty to say today, some cute story that transitions seamlessly into a recipe. But, I have no childhood memories or witty anecdotes about kale. At least, none I can write about to a public audience. I guess I could talk about how I'm such a food snob, yet I bought a bag of freshly-made pork rinds at the Soulard farmers market yesterday...because I'm helplessly addicted to chips of all kinds. There's something...magical about snacks. Ok, maybe not magical...but I do love me some chips. Oh, that salty crunch! It's my only weakness. My all-time favorite snack is Lay's chips dipped in ketchup. A close second is ruffled chips & French onion dip, with Fritos & bean dip right behind. My standard back-up is buttered popcorn with lots of salt. But, I'm an adult now. At 35 years of age, I simply can't eat snacks without consequences like I used to. Chips are a treat for me...something I'll indulge in at a BBQ or party, but not something I buy on a regular basis. Yet, I still crave the salty crunch! To overcome it, I tried making kale chips last week. I'll admit that they did satisfy my craving...and I didn't feel guilty about eating an entire tray's full! 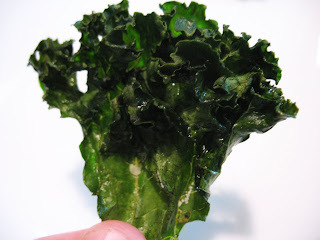 Cut kale leaves (without heavy stem) into 2-inch pieces. Place in a single layer on a baking sheet. Drizzle about a tablespoon of olive oil on top, then toss the leaves around so they are well-coated. Sprinkle with 1 teaspoon of salt and a few grinds of black pepper. Bake at 350F for 10-15 minutes, turning leaves once during cooking, until crispy. Be careful not to burn them or they'll turn bitter! These are really good--I bought a pound of kale at Tower Grove this weekend to do this very thing. They kind of remind me of the outside leaves of roasted brussel sprouts, also awesome. These look so strange! Were they good? I'm not a huge chip fan (we never keep them in the house)--but on occasion we'll have a bag and I'll eat TONS. If you could create a carb-less chip you'd be rich! These are VERY good! A crispy, salty snack with no carbs...and no guilt!